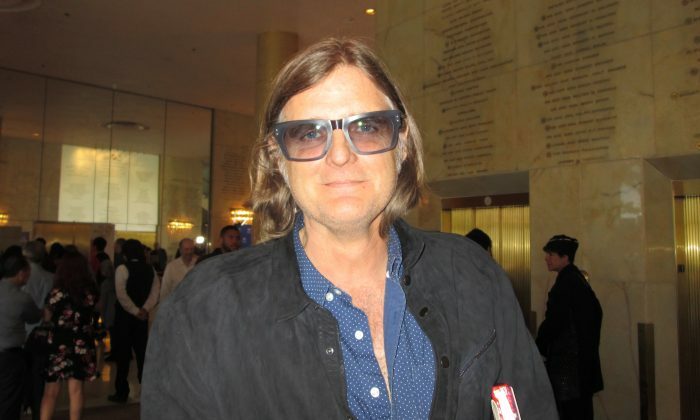 LOS ANGELES—Guitarist and singer-songwriter Valentine “Val” McCallum thought Shen Yun Performing Arts was stunning when he saw it at the Dorothy Chandler Pavilion on April 14. He enjoyed seeing the dancing and the spectacle on stage but it was Shen Yun’s music that intrigued him the most. “Absolutely perfection! It’s so beautiful. The solo is mind-blowing,” said McCallum, who came to see the performance for his daughter’s 12th birthday. New York-based Shen Yun showcases China’s 5,000 years of semi-divine culture through performing arts. The performance consists of 20 vignettes of classical Chinese dance, folk and ethnic dances, story-based dances, and solo musicians. It is also accompanied by a live orchestra that blends Eastern and Western classical instruments to create a distinct yet harmonious sound, something that McCallum enjoyed. “The orchestra—the unique instrumentation of the orchestra—I wish I can see that a little better, I can not see them from where I am sitting. I love those instruments,” he said. McCallum is an experienced musician himself, having served as a studio musician for many well-known musicians such as Jackson Browne. “Shen Yun’s dance revolves around classical Chinese dance and ethnic dances, and the music is tailored to the dances. As we write the music for different dance numbers, we need to fully appraise how to best echo the local traits and flavor,” Tan added. Moreover, McCallum said he particularly liked listening to the erhu virtuoso perform. The erhu, also known as the Chinese violin, is just one of the many Chinese instruments that play in the orchestra. This year, audience members were fortunate to experience it in its own solo piece. This unique instrument has a history of over 4,000 years and was an integral part of folk performances, operas, and imperial banquets throughout the dynasties, according to Shen Yun. Its body is usually made of red sandalwood or rosewood, its bow is strung with horsetail hair. Through the hands of a master, this two-string instrument has the ability to express sounds of joy, sorrow, grace, or tenderness. It also has been said that the erhu is an instrument most resembling the human voice. Meanwhile, McCallum said along with the music, he liked seeing how Shen Yun uses an animated backdrop to tell stories. “I will definitely recommend it. Yeah, I will,” McCallum said. With reporting by Marie-Paul Baxiu.